Watermill Fishing provide outstanding fishing for pike weighing up to 45lb and brown trout up to 20lb. A true world class fishing centre. 1. What is the best season? For numbers, 15th of March to end of May. For big fish, October to November. 2. The best technique? In spring, surface lure on fly fishing. In autumn, dead bait, trolling or deep slow fishing. 3. How many fish can we catch per day? This depends on the fisherman! Up to 35 a day. 4. Can we eat the fish? No, it is catch and release only. However you can take a nice picture! 5. What is the record for pike? Experience 4 star service like never before! We take extra care to ensure every detail of your trip is carefully tailored and executed. 1. Do you speak French/Dutch? Yes, many of the staff are French. Sorry but we are not fluent in Dutch. It is a mix of French and Irish food. 3. Are you close to the water? Yes, our two feet are in the water! We are only 25 yards from the water. 4. Do you have a bar with draught beer? Yes, we can also organise a trip into the local town. 5. Are the people friendly? Yes, of course, it’s Ireland! Security, comfort and fun. Real bass boats, all equipped with electric engines and fish finders. 1. Do we need a permit for bass boat? No, just be responsible and careful. 2. Do you have fishing gear for rent? Yes, we have a full shop. 3. Do you have electric engines on boats? Yes, Minn Cota V2 with remote control. 4. Do you have a fish finder? 5. Do you have bait? Yes, live bait maggots, frozen fish, and worm. It’s like being in a cosy small hotel, restaurant, bar, and warm friendly service. 1. How many people can sleep in each room? Up to three per room. 2. Do we need to bring toiletries? No, we provide towels, shampoo, and body wash.
3. Do we have to drive from the airport? Yes, if you wish with a rental car, or we can organise transfer. 4. Do we need to bring an electrical adaptor? Yes, our plugs are different. 5. How many people can you take? We have in total 16 beds. 45000 acres of wild water, containing 100 Islands. 1. Do we need a fishing guide? Not necessarily, the lake is very safe. 2. Do we need a navigation permit? No, feel free to roam. 3. How deep is the water? Average of 2-5 metres deep, with 25metre pits. 4. Is there lots of currents in the river? Not at all, just a slight movement in some parts. 5. Can we get lost? It hasn’t happened so far! The river is marked with numbers for navigation and we provide very detailed maps. A fisherman’s heaven awaits you at the Watermill Lodge. With wonderful fishing opportunities all year round, it is no wonder Chef Pascal Braussard decided to build his fishing lodge here, so far from home. With a hidden treasure of trophy fish habit the waters of Lough Erne, The Watermill Lodge may very well provide you with the fishing experience you’ve always dreamed of. With fish of this calibre people may not believe you, however you will always have the pictures to fill them with envy and inspire them to do the same. Please take a moment to browse our website and should you have any queries please do not hesitate to contact us. 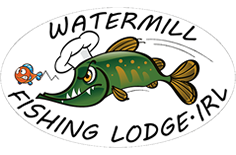 Watermill Fishing Lodge fishing season starts on the 1st September 2018. If you would like to enquire about availability for a fishing trip then press the Book Now button and we will get back to you as soon as possible.